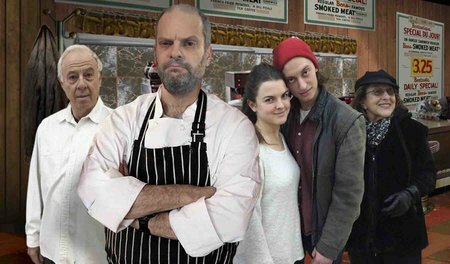 Teatron Theatre’s Delimax playing at the Toronto Centre for the Arts‘s Studio Theatre is not the easiest play to watch. Following the enforcement of Bill 101 in Montreal, Harvey Ostroff’s play questions the meaning of oppression and how questions of sovereignty, independence, and power reveal darker truths. While the subject is timely after recent events in Quebec, we actually travel back in time to confront an earlier vision of the province post-FLQ crises, after the rise and fall of the Parti Quebecois in the late eighties/early nineties. During a bad snowstorm in Montreal, five people wait it out in the titular Delimax run by Max (Ron Boyd). Still bitter about the restaurant’s recent renaming under new language laws, he finds himself embroiled in a heated exchange with the separatist radical Rejean (Aris Tyros), the young boyfriend of his employee Monique (Madeline Leon). Supported by his visiting friend Yetta (Gloria Valentine) and his strange roommate Nathan (Allan Price), Max oversees a lesson in oppression that reveals the truth of life in Auschwitz. As a playwright Ostroff, tries to tackle the complex questions: what constitutes oppression? How do we define it when we relate it to something as terrible as The Holocaust? Delimax wants to be a hard hitting exploration of the damaging effects of oppression, a statement about the horrors people face because of hatred. What we get is a play that refuses to focus on the meat of the questions it wants to address. Plagued by awkward pacing, too many characters, and strange comedy, I was left more bewildered by the play in its entirety. While I thought I saw the core of the play, the baffling journey left me frustrated. Secondary characters served little function in the moral point of the play. I’m not sure if direction is to blame, but at times reactions served the plot instead of creating three-dimensional characters in an unbelievable situation. This left me with the impression of inconsistency that was hard to shake. Let me describe an excellent point made by my guest as an example. She looked at me and wondered why, exactly, the play started out focusing on Bill 101 and the changing of Delimax’s sign when Max’s opponent, Rejean, is a French-Canadian man concerned with English occupation of Quebec. It is a small complaint, but this specific misdirect is just one of many that prevent a nuanced discussion of oppression by adding one layer too many without examination. Ostroff had something to say, but in trying to say it the play becomes muddled by the frustrating details that the audience is meant to just accept in the face of the difficult subject matter. There were some great aspects to the show. Both Leon as Monique and Price as Nathan are great to watch on stage, easily stealing their scenes with fantastic comedic timing and truly touching pleas for sanity. And, even if awkwardly placed, Delimax has some great comedic lines that initially serve to dispel the ominous shadow of the past. Overall, I’m not sure I would recommend the play without reservations. As a Canadian play, Delimax is an important perspective on the rise of nationalism in Quebec but it doesn’t offer a true-enough context to address the complex questions it asks. The subject is important but sadly lost in the mix. Shows run Saturday to Thursday at 8pm; matinees are Sunday at 2pm.